A few years ago I discovered the Neil Flambé Capers, written and illustrated by Kevin Sylvester. I really enjoy this series, because they are about teen Chef Neil and his adventures. I was really honoured when Simon Teen Canada asked me to develop a recipe based on the newest book in the series Neil Flambé & the Duel in the Desert. You will understand my recipe concept once you finish the book, so I won't give anything away! I experimented with a few ways of using jicama, a Mexican taproot vegetable. Slightly starchy like a potato, a little bit sweet and crunchy like an apple when raw. I finally ended up with a recipe that I liked. It's kind of a fusion of the Mexican Root Veg with an Indian Sweet Iced dessert called Malai Kulfi. First I peeled and chopped the Jicama into small cubes. (I would suggest that kids get their parents to do this part)!! Jicama is really hard and it was a bit tough to do! Then I boiled the Jicama for about 35-40 minutes (or until tender). Next I added the milk and jicama in a blender and puréed them until smooth. The next steps are to cook down your liquid. (Again kids should get their parents to help with this part)! I poured all of the blended milk and jicama sauce into a large pot, and brought it to a simmer. Then I stirred in, one by one, all of the remaining ingredients. I brought the mixture to a medium boil, and continued stirring until the liquid reduced down until it was about 1/4 of its original quantity. This part takes the most patience, because you have to stand and stir it the whole time; it took me almost 45 minutes. I chose these Lego-men popsicle moulds because I thought they looked cool. Also, I wanted my Angel's Jicama Cream Pops to look like a frozen person! I covered my pops and froze them overnight in the freezer. Then I took them out and to run them under some warm water to get them out of the mould! I learned from this that a rigid plastic popsicle mould is not the best choice when removing a frozen cream popsicle. I would recommend a flexible mould, or individual bowls. 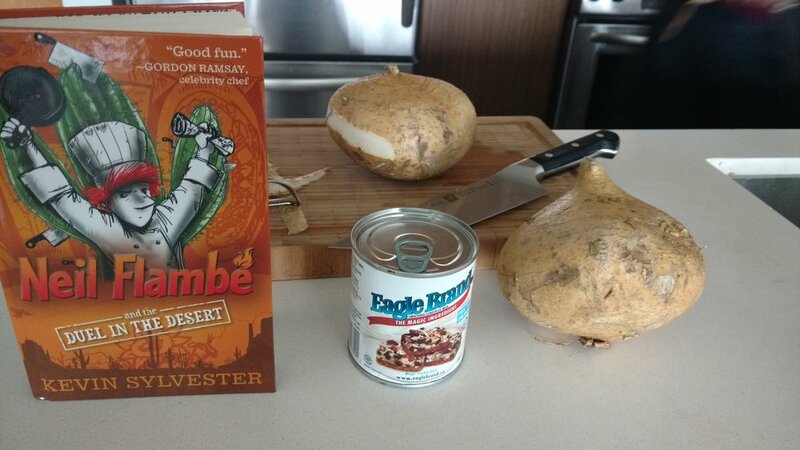 I hope you enjoy trying out my recipe, while reading Neil Flambé & The Duel in the Desert.